Fellow Outlander fans, how did this happen? We were just counting down the days to the August premiere and nearly breaking our laptops, phones and tablets with the number of times we watched the teasers and trailers, and now it’s mid-season break. Did we cross through some kind of ancient standing stones? Because it seems like only yesterday when we were freaking out over the opening theme being released and melting over the first glimpses of Sam Heughan in his kilt. (Sorry, I need a moment. My brain is doing that thing it does when I think about Sam Heughan in his kilt.) For the past eight Saturdays, life has been perfect. 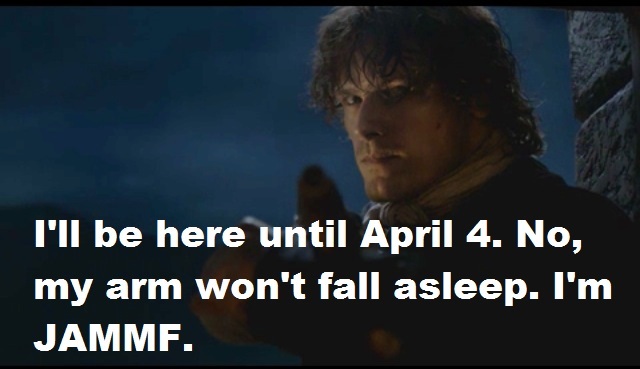 We could shut out the rest of the world between 9-10 p.m. and focus on Jamie, Claire, Castle Leoch and Craigh na Dun. We could eat our body weight in shortbread—or was that just me? The perfection of this show exceeded our already high expectations, and now we have to wait until April 4 to see the rest. 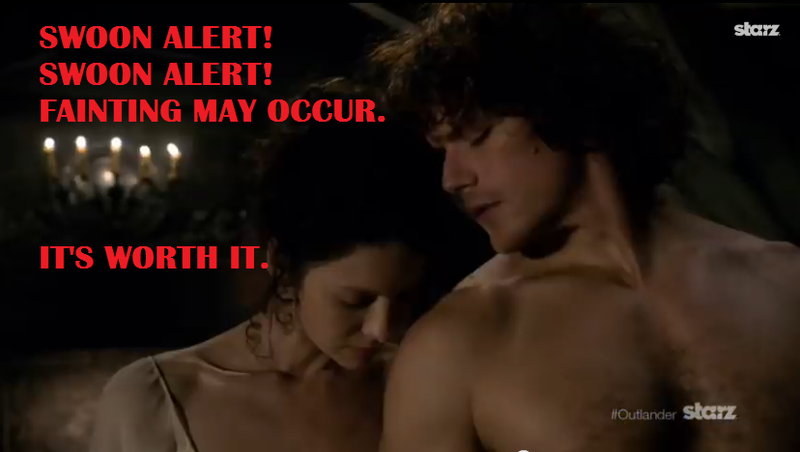 If we Sassenachs band together, I think we can get through this. We can re-read all of Diana Gabaldon’s brilliant books because they are the best things ever. We can obsessively discuss casting for season two and then learn everything there is to know about the unknowns who will likely fill the roles of Brianna and Roger. (Remember when we didn’t know who Sam Heughan and Caitriona Balfe were? What were we even doing with our lives?) And, of course, we can re-watch the first eight episodes until our DVRs explode and relive the best moments of the first half of season one. Here are my top eleven—because ten just isn’t enough. 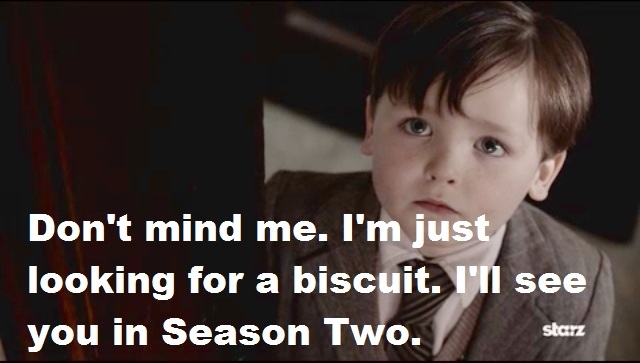 For those who haven’t read the books, the appearance of Reverend Wakefield’s five-year-old son is a cute —possibly random—moment with an adorable kid asking for biscuits. For huge, huge fans of the books and Roger Mac in particular, it’s an excuse to bounce off the couch with delight. Especially when Mrs. Graham talks to Frank about time travel and wee Roger is just standing there all chubby-cheeked and wide-eyed and little. No spoilers here. Just saying. It’s a nice moment. I know Claire feels faithful to Frank and all, but when you’ve got a tall, gorgeous, kind, heroic Highland warrior standing in front of you, ready to marry you in order to save your life, is the fact that you don’t know his real name really going to be a breaking point? Okay, I get it. Claire’s got morals. And she’s clearly stronger than I am because I would have been a total, giggling Laoghaire the minute I met him. But Jamie, being perfect Jamie, doesn’t falter. 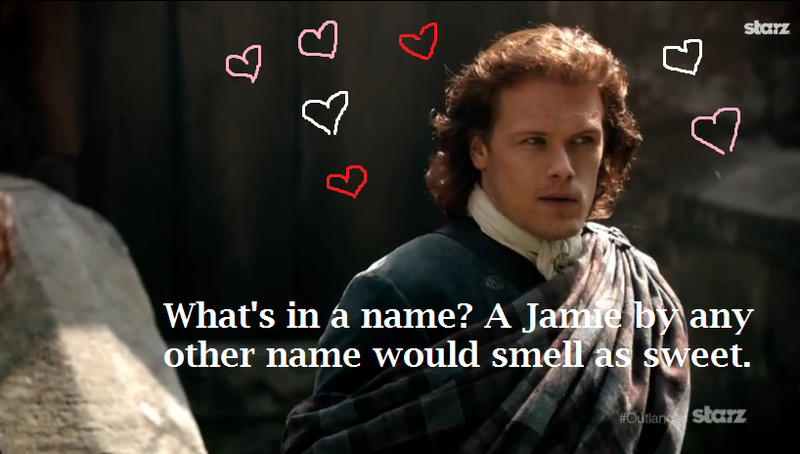 He steps forward and says, “It’s Fraser. 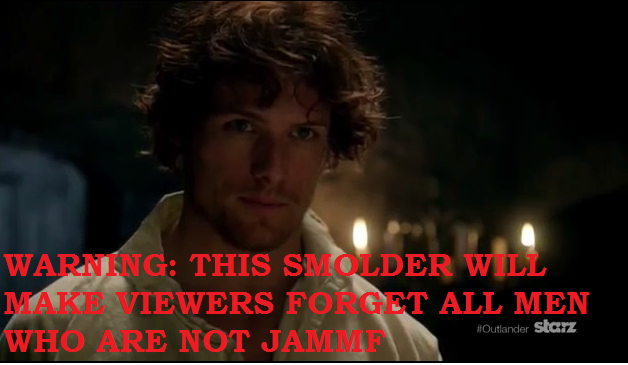 James Alexander Malcom MacKenzie Fraser.” And fans of JAMMF everywhere melt. 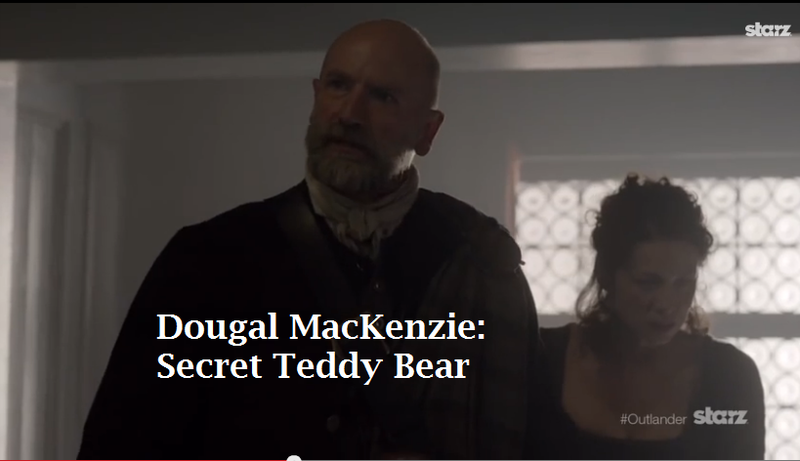 Dougal may act all rough and tough. He may use his nephew’s traumatic history in order to raise money for the Jacobite cause. He may be forward with the ladies after a bit too much Rhenish. 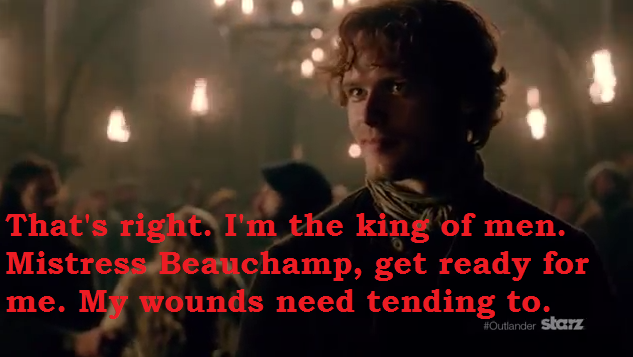 But when Claire gets…er…interrogated by Black Jack Randall, it’s Dougal MacKenzie to the rescue. Tell me you don’t want to give him a big, squishy hug when he asks Claire, “Are you all right, lassie?” Sure, moments later he thinks about cutting her throat if she turns out to be an English spy, but it’s not like he’d enjoy doing it. 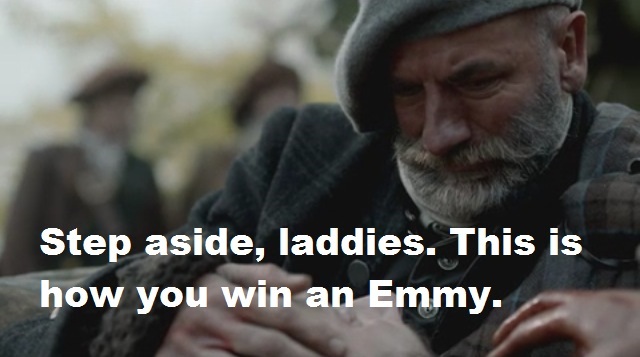 The death of Dougal’s friend Geordie is the moment that gets Graham McTavish the 2015 Emmy for Best Supporting Actor. It’s also the moment that allows Claire and Dougal to understand and respect each other. And it’s the moment that reminds us that we should never go hunting for wild boar, ever. All of the stuff with Claire and Frank in 1945 is great. They’re a lovely couple. They use their creaky mattress to toy with the nosy innkeeper. She supports him while he nerds out over his family ancestry. She hunts for interesting herbs. But come on, people. 1743 is where it’s at. The minute Claire hears the screaming from inside that standing stone, we all want nothing more than for her to touch it and fall through time. And the way that it is handled—not with goofy special effects, but with a flashback to a car wreck she once experienced—is better than any of us could have imagined. Black Jack Randall. How evil is that guy? Oh, you’re not sure? Well, let him tell you all about the time he administered one hundred lashes upon one hundred lashes on our poor Jamie’s back and enjoyed it. The scene is hard to watch and gripping at the same time. Black Jack slips in Jamie’s blood and keeps on flogging; Jamie is half dead but won’t cry out. This is just a taste of the Jamie/Black Jack saga, and a sign of all the drama—and trauma—to come in the second half of the season. I really want to make this moment about Claire and not Jamie. She completely holds her own during her second interrogation with Black Jack at Fort William. She totally has his number with the whole Duke of Sandringham business. When Black Jack comes back with his, “You mean the duchess?“ card, I want to shout, “Keep it together, Claire! He’s lying! Remember what Frank taught you about interrogation!” But let’s not hold it against her. Black Jack is a sadist. He’d never let her walk out the door that easily. And just when it seems that we’re going to be left hanging for six months with the image of Black Jack on the verge of assaulting Claire, JAMMF busts in with his, “I’ll thank ye to take yer hands off my wife.” And now we have that image to dream about until April. I don’t have much to say about this aside from the fact that I have never in my life seen anyone look hotter than Jamie Fraser when he tells Claire his clan motto and basically smolders right through the TV screen. There is only one thing better than Jamie Fraser in his kilt and that is Jamie Fraser without his kilt. Ay caramba. But seriously, seeing Jamie in nothing but his super-long shirt…and then without his super-long shirt…is not the real beauty of the wedding night. Or not all of it anyway. Watching Jamie and Claire truly get to know each other and—hello—begin to love one another is what we have all been waiting for. And when he calls her “mo nighean donn” for the first time? I’m pretty sure that’s why they invented the rewind button. There are so many great Jamie moments—oh, and other character moments also—but our introduction to Jamie’s scarred back is really our first introduction to Jamie. Yes, he’s awesome in the pilot (especially when he tells Claire he will pick her up and throw her over his shoulder), but this is when we start to see what he’s all about. The flashback to Lallybroch. His protectiveness over his sister, Jenny. His ability to headbutt a redcoat. The good-humored tone he takes at certain moments during the story (“Why were you escaping in the first place?” “They were holding me prisoner”) only heightens the intensity of his past and the strength of his character—because he is not the kind of man who will have anyone pitying him. So, Claire, just forget about Frank because you’ve got the god of all men here. And People magazine, just name Sam Heughan Sexiest Man Alive and get it over with already. Do you have a favorite moment that I left out? (Because, let’s face it, every moment of this show is amazing.) Do you have any advice on how to get through the rest of the fall when every pumpkin muffin/bread/pie resembles Jamie’s ginger hair? Please share your thoughts. In the meantime, I’ll be brushing up on my Gaelic with my foreign language tutor, Starz on Demand. For more on Book Perfume’s biggest obsession, check out All Things Outlander. Awesome. Think I’ve got to go back and rewatch some of those episodes. Side note: since buying the soundtrack and listening the hell out of it, it’s heightened my appreciation of the music as I watch. The themes and subtleties of the composition become clearer, and heighten my understanding of what I’m watching in the story. It’s brilliant having that storytelling dialogue become a bit clearer. You’re so right! The score is just brilliant and conveys so much.